At this year’s event, held on 17th May at the Holland & Holland shooting grounds, the Horners entered two teams. Our Court Team consisted of Past Master Lynn Walters, Court Assistant Charles Bettinson, Liveryman John Roll Pickering and a guest Mike Berry. Some heavy showers fell during the day although there was mercifully little wind. Although most of the targets were familiar from earlier years we still found them to be challenging, especially the High Tower. The Court Team were places 27th out of a field of 76 places. 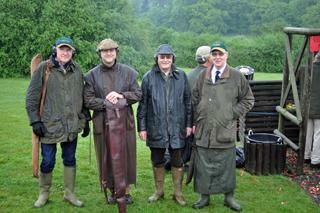 Our second, guest, team was manned by our friends from Hazeley Lea Shooting Club. They were placed second overall winning the prize for non-livery teams. See all pictures in the Photo Gallery here.